In het Augi magazine staat een overzicht van de nieuwe Autodesk Producten en wat deze 2014 releases zo interessant maakt. Zeer interessant om alvast te watertanden! 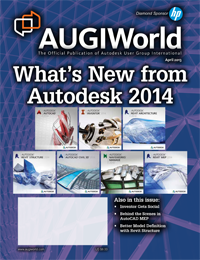 Brian Benton walks you through "What's New in AutoCAD 2014." Inventor gets"Increasingly Social," and John Evans describes how users of this robust release can easily tap support resources in the Inventor community.